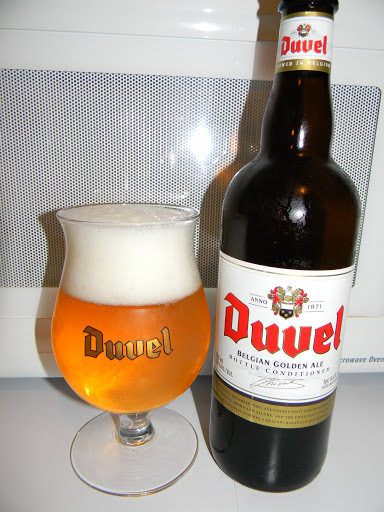 Duvel | Beer Apprentice - Craft Beer News, Reviews, Interviews and Info. Hello everyone. For today’s craft beer review I’m going to be trying the Maredsous Abbaye-Abdij Blonde 6 produced by Duvel Moortgat located in Breendonk-Puurs, Belgium. I had the 10 not too long ago and really enjoyed it, so I’m eager to see how this 6 holds up in comparison. Here’s the commercial description from the website, maredsousbieres.be. The light Maredsous Blonde was the abbey’s very first beer. Nowadays, the monks still drink it daily at lunch. 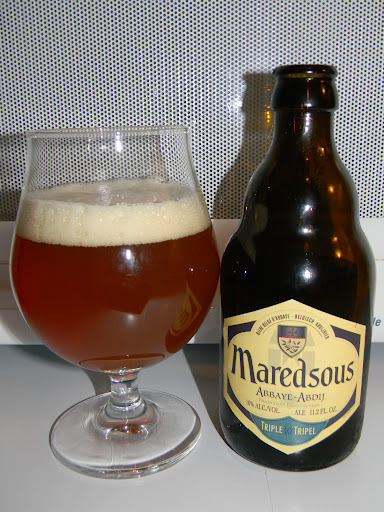 Maredsous Blonde (ALC. 6%) is a delectable Blonde ale with sprightly fruitiness, soft malting, and a slightly dry, gently-hopped finish. A sparkling nose, complex flavors, and a touch of bitterness give this fine ale all of the refreshing qualities of a classic Belgian Blonde. This beer comes in an 11.2 oz. bottle and it has an ABV of 6.0%. It poured a cloudy orange to amber color with chunks of sediment floating about. The collar was slightly off white and of decent size. It was kind of creamy, but yet a tad fizzy also. The retention time was ok and the lacing was acceptable. The nose had a very noticeable yeast and sour dough fragrance. Very herbal and earthy too. Some fruity notes of over ripened apples and lemon citrus coalesced nicely with light touches of coriander and pepper. Overall, the nose wasn’t overly complicated, but rather fitting and pleasant. The taste was extremely similar to the nose. Heavy hints of yeast and slightly toasted sour dough breads. More of those earthy hops and day old apples. The lemon citrus seemed a bit more relaxed, however still noticeable. The spicy pepper added a nice bite on the back end and the complete flavor profile seemed quite “round” and comforting. Also, very well balanced I thought. The mouthfeel was medium bodied, smooth, kind of soft and dry. The carbonation was good and a real nice dose of flavor was left behind on the palate after each sip. This is a pretty nice beer I must say. It was a tad straight forward, but it still had enough of the proper characteristics to make for a very pleasing drink. The drinkability was super good and I think it would be well suited on a warm Spring or Summer day. I’ll tell ya, I’m liking these Maredsous beers quite a bit. I, obviously, need to try the 8 to complete the trilogy. They all seem solid and appropriate, so I’m sure the 8 will be very good as well. I would definitely recommend giving the Maredsous Blonde 6 a try if you can obtain it. It’s, all around, a very enjoyable drink. Hello again guys. Thanks for checking in on another craft beer review. For today’s review I’m going to be trying the Maredsous Abbaye-Abdij Tripel 10 produced by Duvel Moortgat located in Breendonk-Puurs, Belgium. I’ve never tried this beer before, so let’s just jump to the website, maredsousbieres.be, to find the commercial description of this brew. Maredsous Triple is served in the abbey on special occasions. Its elegant smoothness hides its alcohol content and makes it the connoisseur’s beer. 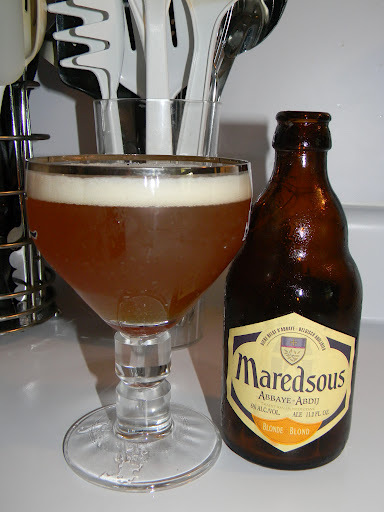 Maredsous Triple is a golden-bodied Belgian Triple, redolent with festive sparkle, creamy body, and a luscious head. Its elegant smoothness belies the strong alcohol content. You’ll revel in its balanced, long, and warming finish. This brew has an ABV of 10.0% and it comes in an 11.2 oz. bottle. The Maredsous 10 poured a very nice, semi-clear, deep orange to amber color. It had a very smooth and frothy, off white head with small tight bubbles. It was decently sized and compact. The retention time was very good and the lacing looked quite sufficient. Some clear alcohol legs were left clinging to the glass when tilted from side to side, which provided a very aesthetic appearance. The smell revealed a nice bit of sourness with a well blended “funk”. Hints of soured pear and grapefruit along with an exquisite amount of sour dough bread and Belgian yeast. Tones of spice in the form of clove and pepper melded well with some floral notes and an herbal quality with a slight redolence of alcohol. This bouquet was wonderful!!! Super well balanced and pleasant all around. The taste presented a good bit of sourness as well. Yeasty, sour dough with hints of freshly baked “Amish” bread. Savors of grapefruit and pear that were slightly past their prime really set this thing off. It had some funkiness, but not like the kind that one might find in a Geuze or a Lambic. Rather, more of an earthy, subdued, gentle “funk”. Solid tones of spice in the form of white peppercorns gave a bit of a bite and sturdy jolts of alcohol reaffirmed that this baby was 10% ABV. The overall flavor profile was quite toasty through and through. Man, this thing had a great flavor. The mouthfeel was medium bodied, very smooth, very dry, chewy and lively. The carbonation was spot on too. A very relaxed warmth was felt along with a hearty amount of flavor left behind on the palate. Whoa. This was a great beer to say the least. It was very robust, sturdy and solid in all aspects, but somehow remained super well balanced. I definitely want another one of these. Although I would classify this as a “sipper”, it was still relatively easy to drink. It was gone before I knew it. It totally hit the spot on the night in which I tried it that’s for sure. I would highly recommend that you guys pick up a bottle of the Maredsous 10 if you have the opportunity. It’s one of the better Tripels I’ve had in a while. It has enough character to be pondered for the entire drinking experience. Well, at least I did anyway. Man, I wish I would have picked up another bottle. Tonight I would like to share with you my review of a beer that is somewhat of a cult classic. A beer that always receives high marks. One called Duvel Belgian Strong Ale from the Duvel Moortgat brewery in Belgium. First, a little bit from the brewer taken from the website duvelmoortgat.com. Duvel is a 100% pure and natural beer, with no additives or preservatives. And you can instantly taste the difference. Its surprisingly high alcohol content (8.5%), huge, creamy head, delicate effervescence and silky smooth mouth feel is what distinguishes Duvel from other Belgian beers. With its subtly bitter bite and delicate aroma. Duvel holds a unique position within the rich Belgian beer tradition. After bottling, the beer continues to ferment for a fortnight after bottling in the warm cellars of the brewery. Finally, the beer is chilled for 6 weeks in the cold cellars. This extra long maturing process is unique and contributes to the exquisite flavour and pure aroma of Duvel. So, without further ado. Let’s try it. An 8.5% ABV beer poured from an 11.2 oz. bottle. The beer poured a clear, straw yellow/gold color with a very thick, rocky, soapy, white head with both large and small bubbles. The head retention was excellent with lots of lacing left behind as it went down. Through the glass I can see tons of bubbles screaming to the top. It looks very lively. It was a very clean smelling brew with notes of lemony citrus hops and bready malts. Smells nice, fruity and very fresh all the way around. No real alcohol fragrance stands out, but I did detect some spice or peppery notes at the end. It’s balanced very nicely. With the taste I, again, got a slight lemon flavor, however this time I got a splash of the alcohol. The alcohol was not harsh, but rather favorable and light. Some mild hop bitterness with touches of green apples. Very nice, well balanced and prominent. The mouthfeel was medium, dry, crisp and smooth with some alcohol warmth and bite. The palate was covered admirably and evenly. Well…. This beer is really good, however I don’t flip for it like some seem to. I am more than happy to drink it and it is very well made and very well balanced, but personally, I wouldn’t want to drink it continuously. I could have a few no problem, but with the high ABV, I would have to watch out with this one. It does come in a cool little bottle though.